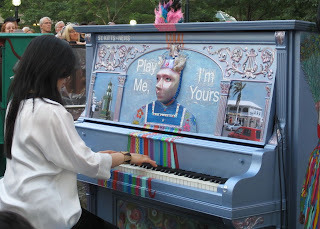 I couldn't resist going out to see the launch of these fantastic pianos that will be scattered around Toronto until the end of July. The event is a lead up to the Pan-Am Games in 2015. The promoters gathered together 49 used pianos and had artists who were born in the countries that are participating in the games decorate them. The artists, who now live in Canada did a fantastic job. Here is one from Granada. There was a big outdoor display next to the Roy Thompson Hall last night. 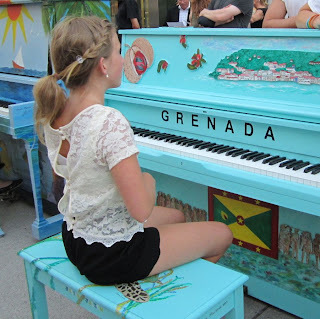 All the pianos were there with fabulous pianists playing great jazz pieces. 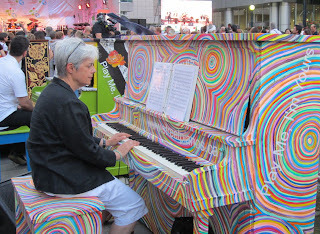 There was also a piece that all the pianos played together - quite amazing. Here are some more pictures. Sorry I don't now which countries are represented in these two. I like where I live, but sure miss seeing all the fun things in downtown Toronto.